Driven by mega-trends such as globalisation and digitalisation, the world is changing at a rapid pace. This has an immense effect on our customers’ markets and products. As we see it, our job is to provide and implement the right responses to the increasing demands of the market. With a great deal of experience, expertise and ideas, we support technological progress and turn challenges into solutions. The resulting creation of new and improved springs and bent parts puts new options for optimising products into the hands of engineers and designers. This allows GRUEBER customers to impress their end customers and get them excited about their products over the long term. For almost 200 years, iron has been forged and formed into high-quality products in the GRUEBER factory workshops. And the whole time, we have continuously worked on further developments in close cooperation with our customers. In the meantime, we have become a leading international partner for solutions in the development and production of springs and bent parts for a wide variety of applications and industries. Today, instead of using a hammer and anvil, our production takes place with highly advanced, state-of-the-art machinery as well as with experienced, intelligent and committed employees who breathe life into our unique quality standards. From 50 thaler coins to a world success: Johann Peter Grueber founds his own blacksmith shop by purchasing an anvil for 50 Prussian thalers and renting a forge. Steam power, railways, industry: GRUEBER employees travel to London to visit a large technology exhibition – and they bring new ideas and momentum into their work. Conquering the world: A young Willhelm Grueber confidently presents his advanced forged products to French ruler Napoleon III at the large world exhibition. He wins a medal for outstanding quality. A premiere: The first spring leaves the GRUEBER factory. 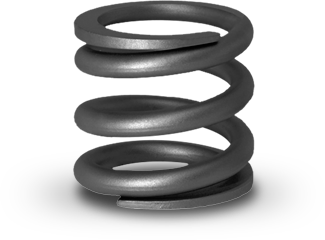 A new era begins for GRUEBER with cold-formed compression springs, tension springs and leg springs. GRUEBER keeps the peace: Ongoing production includes springs only. At the end of the war, the factory is heavily damaged by bombs. A setback: By an order of the English occupying force, the GRUEBER spring factory is to be completely dismantled by 1948. The zero hour: After 75 per cent of the company is dismantled, GRUEBER is removed from the destruction list. In late summer, GRUEBER is producing springs again. GRUEBER relocates: The new factory is built in Hagen-Kabel. High-flying springs: GRUEBER supplies the springs for the ICE1 fleet of the German Railway. And it remains the main supplier of springs up through the current ICE3 fleet. Worldwide success: GRUEBER builds a spring factory in India for Indian Railways. The Indian state-owned railway company, one of the largest employers in the world, transports more than 5 billion people each year. Springs in a blaze of colour: A new powder-coating facility provides brilliant effects in Hagen-Kabel and around the globe. Investment in CNC bending technology: For the first time, a single-head bending machine is used to manufacture leg springs and bent parts in a range from 3 to 12 mm such that they are discharged from the machine whole. Springs for the new millennium: In June 2000, the Millennium Bridge was opened and then closed again after just two days due to uncontrollable swaying. In 2002, it opens again: GRUEBER springs ensure safe passage across the Thames. GRUEBER relies on environmentally responsible technology: A new coating facility for high-quality, water-based liquid coatings sets new benchmarks – and receives an environmental prize. GRUEBER expands: Due to high demand, GRUEBER significantly expands its grinding capacity. Advanced technology for heavy springs: GRUEBER invests in a CNC-controlled coiling machine for heavy coil springs. Capacity expands in the area of hot-forming: The second coiling line for heavy coil springs is commissioned. Setting machines with integrated measurement testing technology for length, force and rate inspection are brought into the production process. Testing and application of the CNC bending machine BM-90: GRUEBER monitors machine development as a partner. A size range up to a wire thickness of 16 mm is now possible and the product range is extended to include large bent parts and leg springs. CNC-controlled end roll for rod diameters up to 65 mm is commissioned. Expansion of factory space allows high-rack storage to be integrated. In this way, we can meet the logistical needs of just-in-time deliveries and greater production capacities with increasing deliveries. Introduction of the LEAN and KAIZEN methods to increase on-schedule handling and delivery for customers and to work toward developing the GRUEBER system into a synchronous production system. GRUEBER currently has almost 200 years of experience in metal processing and spring production. With 180 employees, we produce about 10,000 tonnes of steel springs and bent parts yearly at the Hagen location. There are GRUEBER springs and bent parts for a wide variety of applications and in a broad range of sizes – with rod diameters up to 65 mm and unit weights up to 200 kg. Are you interested in our springs? Just ask. You can call us anytime or use our request form by filling it out. We will process your request immediately and present you with a solution.